last Tuesday, mom went to Manila and we spent the whole day bonding together. we ate at California Pizza Chicken and then did some shopping. and for this special mother-daughter date, i decided to wear the colors of one of my favorite fruits...GRAPES! 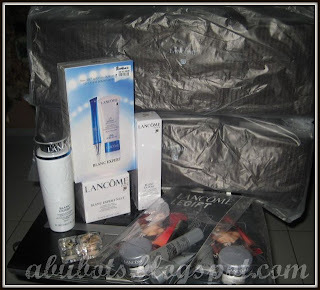 i was able to try Lancome's Blanc Expert when mom bought items from them weeks ago and gave her samples of these...i happened to like it so i decided to get full sizes. Besides, I need an alternative to my OBAGI regimen since i only use it as a maintenance nowadays. and guess who's the new owner of this "ohhh"-some phone? and take my advice, do stay away...and i mean STAY AWAY from the mall when you are stressed. 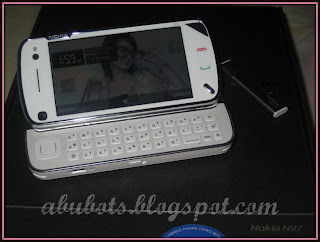 nokia n97.. I hear that it's f amazing, but honestly... XD I love the smaller querty keyboards and I just got my E71 so.... 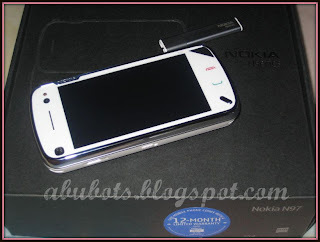 I shall wait for it's baby... N98 XD!!! sis, *hugs* thank you sa cbox message, I am back and thank you talaga. Love your grapes--you look so beautiful. Love to hear what you think of the Lancome Blanc Expert.